Christmas comes but once a year, and so does my annual holiday cookie swap, so I like to make it as memorable and fun as possible. It’s my absolute favorite party of the season. 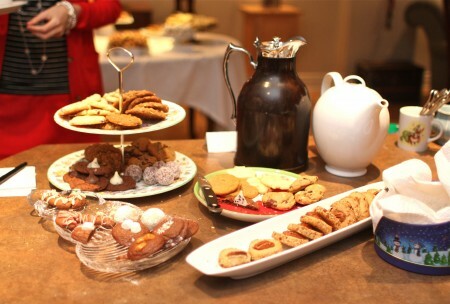 I get to connect with friends from all over, sample mountains of cookies of all varieties and sizes while sipping hot spiced apple cider and exceptionally tasty homemade eggnog. What’s not to love? Last weekend was the Big Event and it was a smashing success! 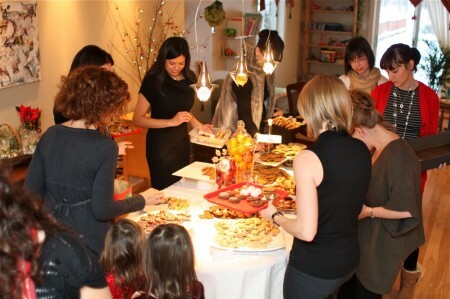 Twelve girls, a few guys, and ten excited children braved a snowstorm and gathered in my home to swap over a thousand homemade cookies. Here’s the recap. 5:30 am – I’m up baking cookies. My chosen theme this year’s swap is ‘The Best Cookie of your Life’. It’s more to up the ante for the swap, because the ‘best cookie’ is really subjective. Anyway, we’ll be taking a vote and declaring a winner at the end of the day. I’m baking Browned Butter Triple Chocolate Chunk Cookies, basically THE best chocolate chip cookie ever. The recipe is adapted from Alton Brown’s recipe, except I brown the butter, add three types of best-quality chocolate, and chill the dough for 36 hours. They. Are. Amazing. The place is smelling good, and it’s not even 6 am. I’ve got thirteen dozen to bake, so I’m there for a while. During the baking, I multitask. I simmer some toasted steel-cut oats for breakfast, send emails, hang a few more Christmas decorations and drink a lot of coffee. 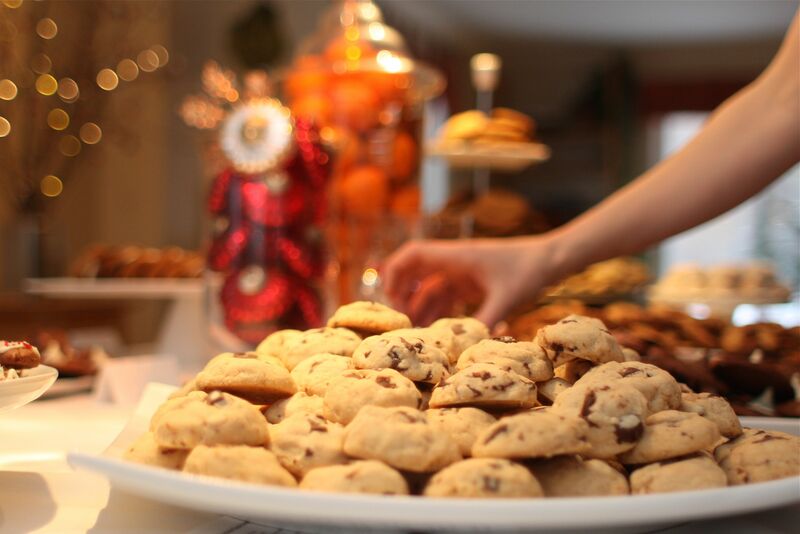 The cookies are looking good, and now cover every surface of the kitchen. 7:00 am -The kids come downstairs in their pjs, already wriggling with excitement, and we have breakfast. There’s a gentle snow falling outside and we talk about the recent wolf sighting on our lane. True to form, I burn the last batch of cookies, so Danny takes two outside and gives our baker snowman two jet-black eyes. Later, he keeps the boys busy while I wrap up the party favors for the children. Earlier in the week I made peppermint marshmallows, adapting this basic recipe with some peppermint extract, and chopped them up small. They will be a perfect topping for hot cocoa on Christmas Eve. The mini marshmallow favors are in a basket on the buffet, along with the prize for our ‘Best Cookie’ winner, The Gourmet Cookie Book . 8:30 am – I wipe down the kitchen and start setting up stations: hot drinks, cold drinks, and two tables for cookies. I’m serving homemade eggnog that I made the day before, a tart cranberry-pomegranate punch to combat the inevitable sugar high, hot spiced apple cider, tea and coffee. I tip the cider into the pot, add all the ingredients, and turn the burner to low. In no time, the place begins to smell better than fresh apple pie. I don’t have a fancy box with assorted teas, but a mini loaf pan displays my tea bags just fine. 10:00 am – CTV, our main news station, calls to say that due to the forecast for freezing rain, there is a chance that they won’t be coming. They had asked earlier in the week if they could send a journalist and a camera guy to the swap. I had said, sure, come crash the party. Right now the snow is falling thick and fast. I make a Greek salad, marinate two fat chickens, and prep a few things for supper. I’ve invited anyone who can stay to join us for supper; I’m certainly not sending anyone away hungry, especially not in a snowstorm. CTV calls and cancels. I’m rather relieved as I’m expecting nearly twenty guests and was worried that a TV crew would disrupt my event. I prep the punch. 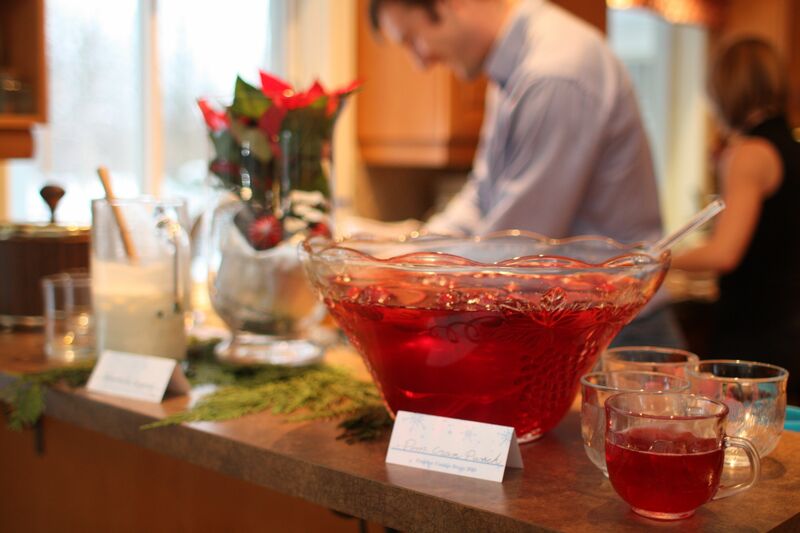 It’s my first time to make a punch ring – cranberry juice frozen in a bundt pan, and then added to the punch bowl. I feel a bit silly, but know it’s going to keep the punch cold and not water it down at all. 1:30 pm -The snow is ankle deep on the driveway. Danny is making a valiant effort to shovel, but eventually flags down our neighbor in his tractor with a plough. I hustle some cookies out the door and Danny has a brief exchange with him. In no time the area in front of our house is cleared; it’s only going to cost a tin of cookies later on. I’m thinking this should be a season-long arrangement between us. Danny comes back in and fields no less than ten incoming calls from guests who just want to let us know they are on their way but are stuck in traffic, behind a snowplough, etc, etc. One of the calls is from the TV station: they have decided to come and are on their way. 2:00 pm – Guests begin to arrive! They come bearing bags, tins, Tupperware, and boxes full of cookies. Kids file into the playroom, shyly at first, but it’s not long before the games begin in earnest. 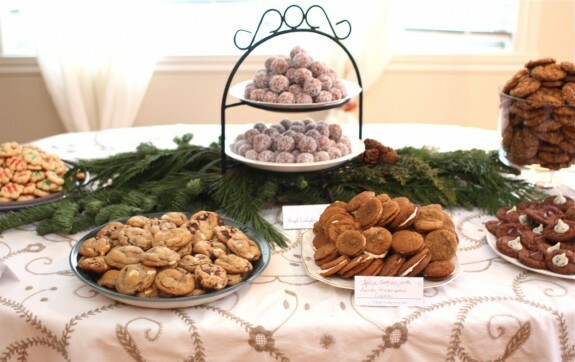 I invite my friends to transfer their cookies onto platters I have provided. 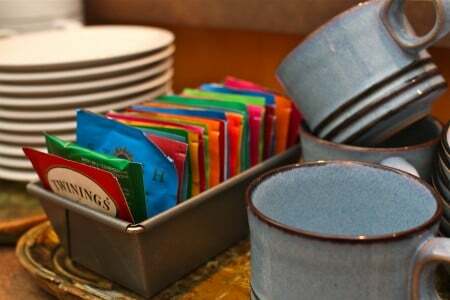 This frees up their tins to welcome in new cookies and makes for an attractive display of cookies. The table fills up quickly. This is Andrea, with a gingersnap tree. She’s just raised over $16k and is leaving in a few weeks to climb Mt. Kilimanjaro for Make-a-Wish. She’s pretty all around awesome. Cookies and more cookies. And a simple centerpiece idea – glass vases, one filled with ornaments and the other with clementines and cookie cutters. Both courtesy of my friend, Melanie. 2:30 pm – I’m basically just directing cookie traffic at this point and my sister is handing out drinks, bless her heart. The snow has turned into freezing rain. 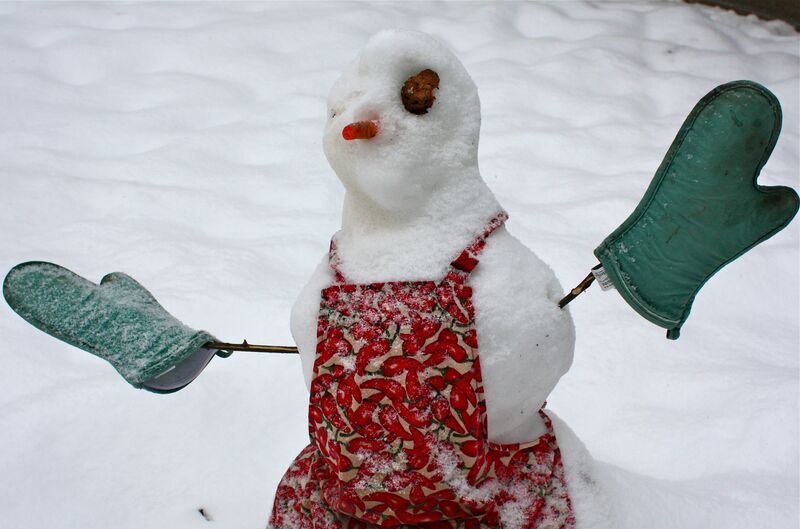 Our baker snowman takes it pretty hard, and one of his burnt cookie eyeballs dissolves; giving him a primitive look. 3:00 pm – CTV calls one last time and cancels. Our cookie party gets bumped for the freezing rain story, and it’s just as well, as the place is hopping. We’ve been tasting and tasting all the cookies; it’s a tough job but we manage somehow. 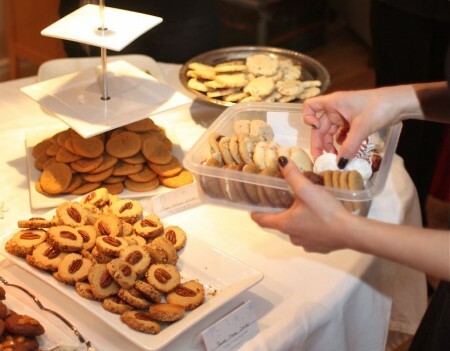 There will be a vote later for the best cookie, so it’s important to taste them all. 3:15 pm – We need an overflow table to spread the cookie love so no one gets trampled and there’s plenty of elbow room. It holds Coconut-Date balls, Whole-Wheat Oatmeal Crisps, Chocolate Kisses, Spiced Sandwiches, my Browned-Butter Triple Chocolate Chunk cookies and there’s more to come. 3:30 pm It’s time to swap. 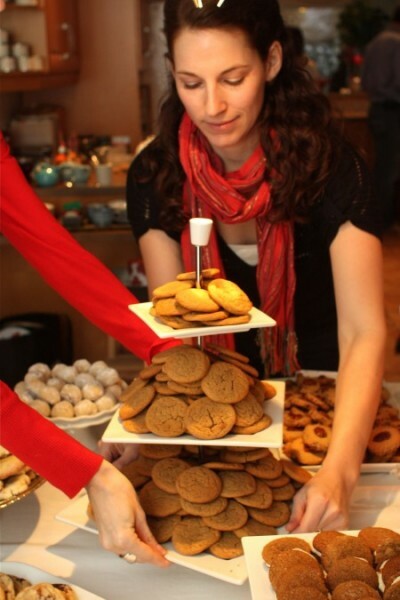 Twelve girls each take a tray or tin and, after a brief lecture by yours truly on taking only as many cookies as you brought, we swarm the tables. 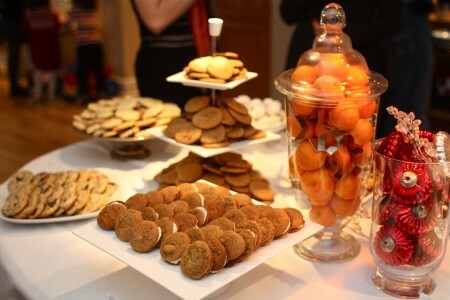 There are thirteen varieties of cookies from traditional shortbread and molasses cookies to maple-pecan cookies and lemon-glazed cranberry-orange shortbread. The platters empty in no time. Approximately 1000 cookies have been divided up and will be taken home to be served to guests. 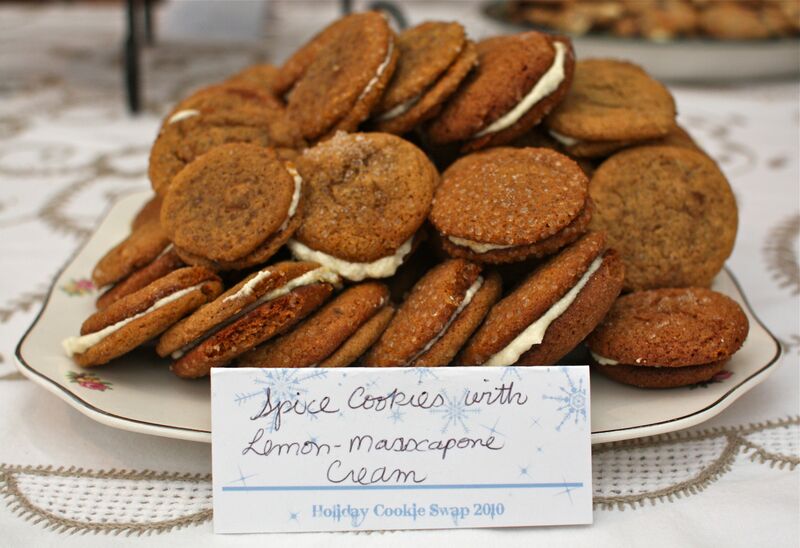 4:00 pm – We vote for our favorite cookie, and Jess wins by a landslide for her Spice Cookie Sandwiches with Lemon-Mascarpone Cream. I present her with the cookbook and we pose. Cheese! Melissa is looking very happy about her haul. She’s a graphic designer and made the little name tags for the cookies. Thanks, Melissa! Behind her is Melanie, who rocked the table centerpieces on very short notice. I have incredibly talented friends. 4:30 pm – The chicken is roasting and a few girls are tossing salads. The kids are pounding overhead, shrieking their heads off and evidently burning off their sugar high. I say good bye to a few people, and top up cider mugs and punch glasses for others. 5:15 pm – It’s dark outside, and a few more cars have left. We herd the remaining five children to the table and fix their plates. Their hair is rumpled, and their eyes are shining; they can sense that Christmas is just days away. We open two bottles of wine -white & red- and sit down around the table. We’re starving. I realize that my feet hurt and try to remeber the last time I sat down. 7:30 pm – Noah and Mateo are asleep. I make a French press of coffee for four and sit down with our last two remaining guests (who have done the dishes while I tucked my kids in). We set up a game of Settlers of Catan and I snag one more shortbread to go with my coffee. It’s beginning to feel a lot like Christmas. 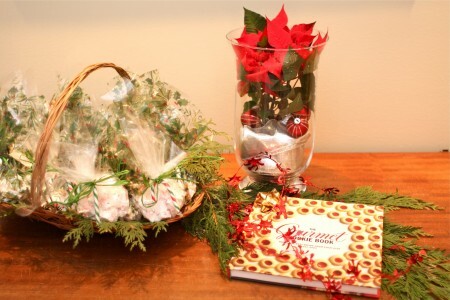 For more on this subject, read How to Host a Memorable Holiday Cookie Swap, my post on Simple Mom. 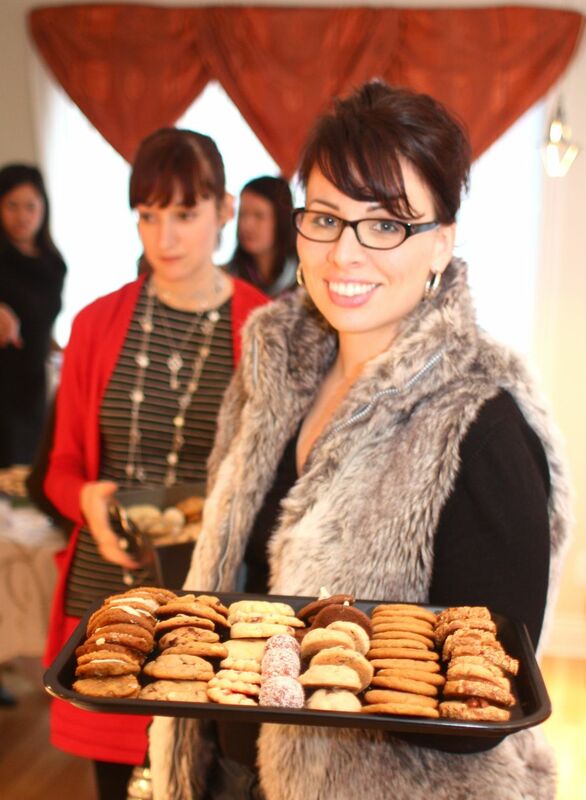 Awesome cookies with incredible people (hostess included). 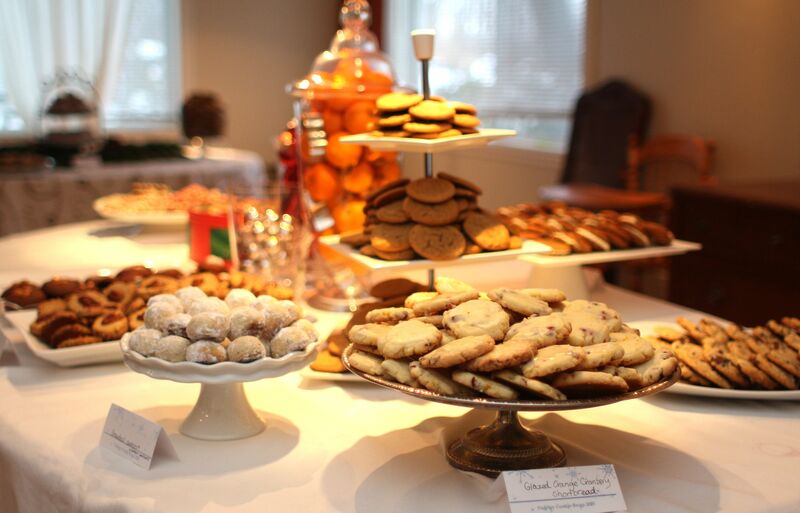 Looks like a great time was had by all and snow will never deter a cookie party! Thanks so much for sharing your joy (and awesome-looking cookies) with us. Oh my gosh, as if I wasn’t loving your story enough, you topped off your evening with our favorite activity: Settlers! When our son finally started a real bed time, our first thought was not, “Oh yay, sleep!” It was, “Now we have time to play Settlers with our friends again.” LOL. =) We have a few couples who we ‘game’ with. Settlers is a favorite, also Agricola, Dominion, and Carcassonne. Aimee, everything looked wonderful! What a fantastic party and talented friends you have! You’ve inspired me to try something like this next year. How fun! About 8 years ago, I tried to put one of these together and it fell apart. I have not had the courage since. This looks absolutely wonderful! I am going to plan on having one next year. Thanks for sharing! Lisa, I do hope you try again. I’ve learned to invite double the people now, because it’s a busy time of year and there are always last minute cancellations. Plus with our crazy Canadian weather, you never know who’s going to get snowed in. 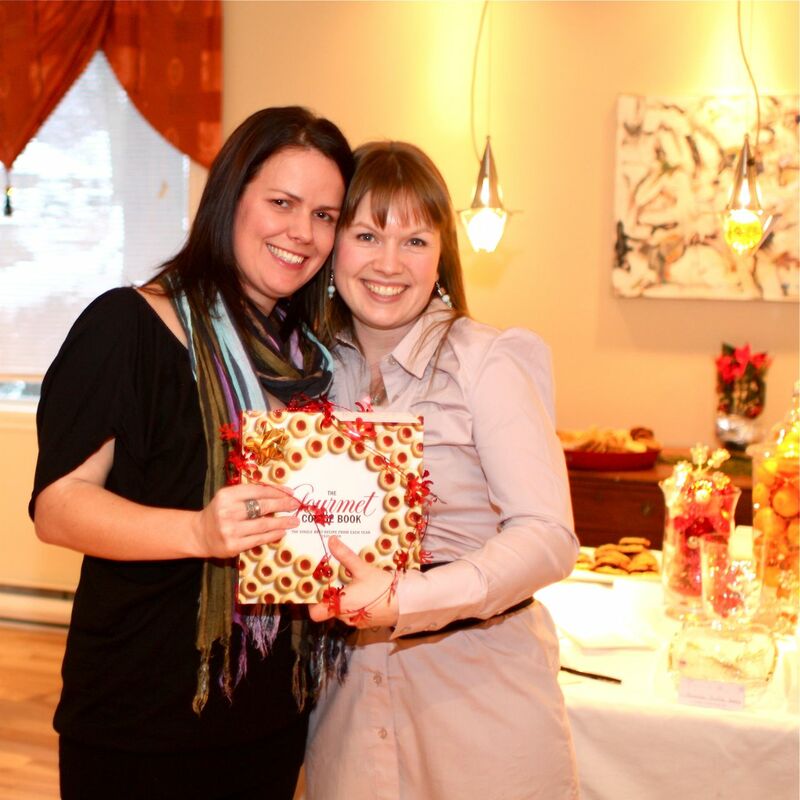 Aimee, it looks wonderful – You and your girlfriends are an incredibly talented group of ladies! There’s gotta be loads of chocolate, especially if it’s the cookie of your life, right? I use semi-sweet chips, white chocolate chips, and dark chocolate chunks. Next year, for sure, we’re doing this. Oh yay! I hope you do! That is quite a cookie swap, no wonder the TV station wanted to be there! And I love the snowman! What a treat! I can’t tell you how much I enjoyed this post!! All the wonderful details made me feel like I was there!! A lovely read first thing in the morning!! Happy holidays! Happy Holidays, Ainsley! Thanks so much for your comment. This post was a bruiser and it crossed my mind more than once….no one’s going to read all this! Really happy you enjoyed it and took the time to say so. Thanks for the great play by play! It makes me more excited for the cookie exchange I’m co-hosting with Lori from Fake Food Free. She lives close by and we are going in with another friend to put on a fun foodie filled party! 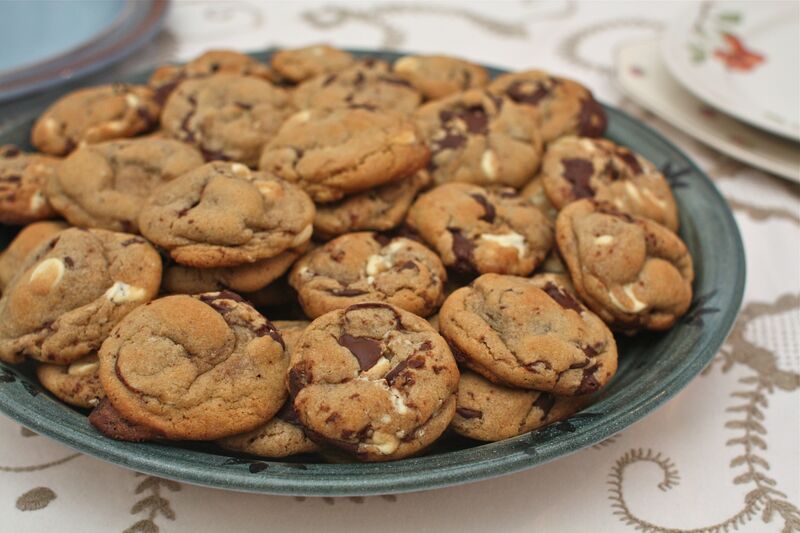 I might just have to add your Browned Butter Triple Chocolate Chunk cookie to my 4 dozen. You’d love them, Melissa! Enjoy your swap. Though I don’t celebrate christmas, that looks like so much fun and the cookies look delicious! You are very blessed to have so many wonderful friends. Wow. 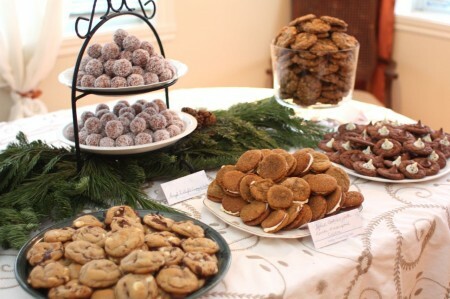 Awesome cookie swap you put on. It looks like it was a lot fun and the cookies were amazing looking. So delicious looking! Looks like a lot of fun! Looks wonderful, sounds wonderful (but exhausting!). I don’t suppose Jess is going to share that winning recipe is she??? I’m going to have to ask her now, I think! Well now I want the recipe for the winning cookie! It sounds heavenly! I enjoyed reading this as much as if I had been there! What a wonderful day. I think I’ll steal this idea for next year. Including the supper menu and the punch. Those centerpieces were so pretty, too. What kind of game is Settlers of Catan? We love games. It’s a good old strategy board game, perfect for families and easy to learn. I refused to play it for ages, ’cause I thought it looked silly, but now it’s one of my favorites! Gorgeous guests…. and the cookies!! WOW! Great recap! Glad to have all those different cookies for holiday treats. What a FUN and yummy event!! Great day! I’d tackle the snow again in a heartbeat to hang with this bunch and share all of those cookies-Not to mention the apple cider- delicious! Can’t wait to make some of my own! Thanks again! Wow, what an incredible idea! Sounds like you guys had a blast!!! 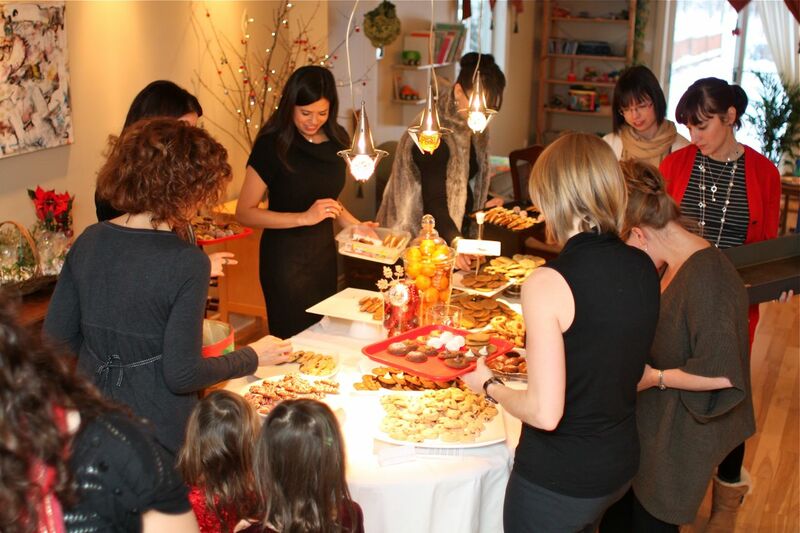 What an awecome Cookie Swap party. Wish I lived in your neighborhood. Everything looks beautiful and everyone is having a great time. What a lovely idea! I wish I could have been there…all those cookies….heaven! I’ve always wanted to do one of these….looks like so much fun! And inspiring. I normally hate cookie swaps, but this ups the ante in a good way (calling for your number one cookie is a REALLY smart idea). It looks like you had lots of fun! Maybe next year, I will attempt this, although I won’t have to worry about a last minute snowstorm here in Florida! Any chance we could get the recipes for the cookies??? I loved this post! I am away from home this year and it made me feel like Christmas was near. 🙂 Thanks for the nice feelings! I also loved the centerpieces, so easy! great job to Melanie. What a great party! I hope I can be that organized this year so I can throw one as well! Great idea! Thanks for sharing! So I know this is 7 years later, but any chance Jess shared the recipe for the Spice Cookie Sandwiches with Lemon-Mascarpone Cream? I have a cookie swap tomorrow and these look perfect! I can only find one recipe from google but they sound crunchier than hers look.